A Journey Along the Carlow Corridor. The archaeology of the M9 Carlow Bypass. NRA Scheme Monograph 16. Dublin. 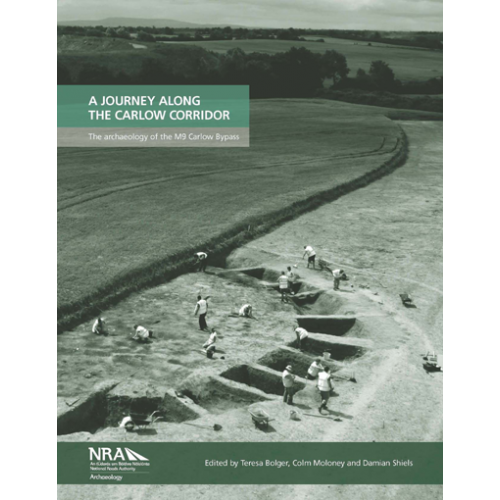 The Carlow Corridor describes the results of archaeological investigations undertaken in 2006 at 57 sites discovered in advance of the construction of the M9 Carlow Bypass. The scheme encircles the eastern side of Carlow town and represents the first phase of the new M9 motorway from Kildare to Waterford. The excavations afforded the opportunity to track changes in the local environment and landscape over the millennia, from the dense woodland of the Mesolithic era to the modern-day intensive agricultural landscape. Indirect evidence of Carlow’s earliest settlers in the Mesolithic era was recovered through the finding of stone tool sites, supplementing results of previous surveys along the Barrow river valley. The discovery of the earliest houses yet identified within the county attest to the presence of settled farming folk in the area during the Neolithic. A booming economy in the Bronze Age is manifest through the domestic, ritual and industrial sites of an extensive and complex cultural landscape. The route avoided upstanding medieval sites; however, archaeology relating to the hinterland of such sites affords intriguing insights into the rural life in the county during the medieval and post-medieval periods. The book is lavishly illustrated and provides the reader with a description in summary form of all the excavated sites. Major findings have been selected, with essays compiled and presented in chronological order, to highlight the principal results. The full complement of radiocarbon dates for the project is incorporated.